It's kind of crazy to consider that O Bar has been around or 11 years this month. 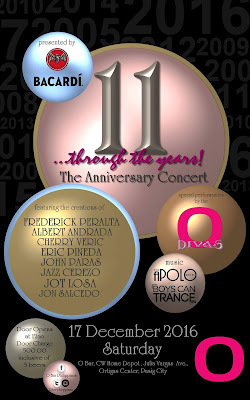 As usual they're celebrating their anniversary in a grand manner with a big anniversary concert night with fabulous drag queen production numbers and fashion pieces from various notable designers. And DJ Apolo and the boyfriend DJs Boys Can Trance will be spinning that night so you can expect the music to be fun. Needless to say we're really looking forward to the night! Door entrance fee is still the standard P500 for Saturday nights which gives you stubs for 3 local beers, which is more than enough to get you started for the night. Expect the place to be pretty packed because (1) O Bar is always crazy full on Saturday nights and (2) so many of us love the bar and have practically grown up with it over the past decade. If you see me and Tobie there, be sure to say hello!